River Phoenix (Stand by Me) and Keanu Reeves (The Matrix) star in the 1991 drama My Own Private Idaho, a drama from Gus Van Sant (Mala Noche) about two young street hustlers. There’s Mike Waters (Phoenix), a sensitive narcoleptic who dreams of the mother who abandoned him, and Scott Favor (Reeves), the wayward son of the mayor of Portland and the object of Mike’s desire. Navigating a volatile world of junkies, thieves, and johns, Mike takes Scott on a quest along the grungy streets and open highways of the Pacific Northwest, in search of an elusive place called home. 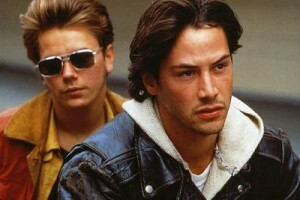 Visually dazzling and thematically groundbreaking, My Own Private Idaho takes a rather moving look at unrequited love and life on society’s margins.